Hurtigruten began over a century ago as a mail service and freight and passenger lifeline linking the coastal communities of west and north Norway - and it still provides that service today, with a vessel going each way every day of the year at all 34 ports along the way. In the last 20 years this has also become a very popular tourist cruise. 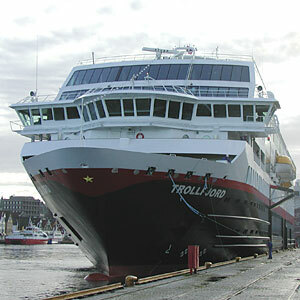 Hurtigruten (or Hurtigruta) is translated as Express Route, but usually called Norwegian Coastal Voyage, or Norwegian Coastal Express in English. Note that if a port is visited during the day in one direction, it will likely be a shorter stop during the night in the other direction. There are two timetables - one for the summer from mid-April to mid-September, and one for the winter. The major difference is that in the winter, the boat leaves Bergen later and does not go into Geirangerfjord or stop a second time in Aalesund. Beyond Trondheim, both timetables are the same. Below you can see a few of the scheduled departures. How can you pick out a few highlights? This is a truly unique journey and you have to experience it to have any real idea of what it is like. I have been on the bridge of ships navigating through these narrow channels with cliffs and rocks all around - at night, with many lighthouses flashing their coded signal to guide the way. Some sections are in open sea, but much of the route weaves through and around the islands. I have also been in some of these small towns when the boat arrives - the buzz of people arriving, leaving, greeting, and collecting or delivering vital packages, before it rushes on its way. Bødø to Tromsø - Lofoten with Raftsunden, Trollfjorden and other long narrow channels between the islands - timings are better southbound. Tromsø to Kirkenes - another world of small weather-beaten fishing communities - all snow and ice encrusted in the dark winter, midnight sun in the summer. Kirkenes is close to the Russian and Finnish borders. Two of the vessels take cruises to Antartica in the northern winter, and a new vessel called Fram (a proud old name) takes cruises all year. We would like to see the hurtigruta extend southwards (with a 12th ship in the circuit) and include Hardanger, Lysefjord and Stavanger / Sandnes. This would allow many of Bergen's visitors to take a one-day-one-night round trip and experience the ships for themselves.